Over the past few years we’ve used a variety of different virtualisation tools but have historically always stuck to a mixture of either VMWare tools (esxi, Player and Workstation) or Microsoft’s Hyper-V platform. These have worked really well for building larger virtual server platforms but recently I was looking for a quick and easy to configure tool that I could use on my own desktop PC. I was just looking to build some simple test machines for evaluating software in a range of scenarios. 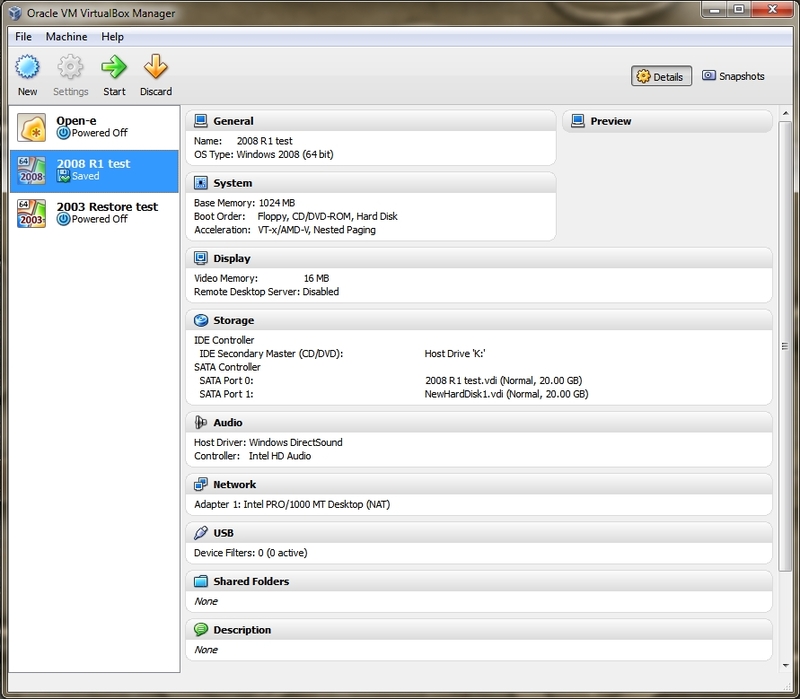 After some browsing I came across Oracle VirtualBox and I must say I’ve been impressed with it so far. The interface looks good, it’s easy to use and provides great support for virtual drives created in both VMware and Hyper-V – a major bonus when moving old VMs around. It also has great support for USB devices which is handy in a lab environment when you need to test a specific backup device for example. If you’re new to virtualisation and just need a quick and simple way to build a virtual machine I recommend taking a look at Oracle VirtualBox. Of course, this post is only to give you a quick heads up that the product exists so I haven’t gone in to any real detail but but I think once you’re up and running you’ll be impressed at how much it can actually do. Feel free to let me know if you found this post useful and also how you’re getting on if you’re trying it out or even already using it. ← RecoverAssist (BackupAssist 6.4) – beta testers needed!